An evocative and imaginative track. How do you do it so consistently DCO? thanks, Nick - no idea what I'd do without CT as an oulet! David's track is the perfect opener for domestic.Aguide that shows us around his house.His guitar playing translates colors and moods. It reminded me of seventies open air copncerts with clouds of marihuana perfume above the heads. There is something of Captian Beefheart's Moonbeams and Bluejeans in it. Gas and Electric is my favourite track, no doubt. It makes me wonder where and how Steve found and worked on these sounds. The power of it also makes me consider the track as an ode and monument to the industrial revolution that gave England for a long time a skyline chimney's and factory's. There is a point of rest in every house. Cats can define this moment at its best. But what Michale does is to underline the fun factor of a cat,the moment you start to tease it, and the cat fakes it is asleep. Fun! I admire Anders, he doesn't make music or sound art,but -really- plain art. I wonder if Anders is at all capableof doing something musically,which i mean in the utmost positive sense. His tracks,and also this one tell me everything about how he experiences music, and how he can find the surreal and absurd in what seems to be the most common. In fact a deeply religious attitude. Bravo! I am glad I have met you. Someone had to do it of course. 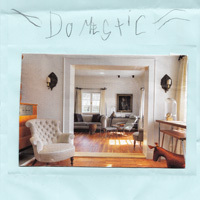 If a theme is 'domestic' you should also hear a Musca domestica. The buzzing of the fly has this strange perspective shifting effect on this track.I like the combination of someone working in his garden house while humming to Sam Cooke's Chain gang. Maybe you don't hear it, I do. Making the domestic exotic. A gamelan made from pots and pot lids. Ah yeah! Dream time, a world in cinemascope,sunset meets the king of siam,endless,endless. For 5 years, the project " Vies-à-Vies " consists of a collection of daily atmospheres and domestic sounds recorded in the windows of my apartment: the microphone outside, the body inside. Two windows: the first one is due north, the other one due south in the last floor of a building without towards. Short and trivial recording of a sound, a movement, a vibration which calls during the day. The listener is in the center of a space understanding two opposite opened windows one of the other one (it also corresponds to my position in the room during the assembly). Anton is so dedicated and talented, one day one of the doors will open and thousands of listeners will stream in. By that time,this little segment will be involved in a play of light and shadow,like all the other miniatures that together make up his portrait of an age in transgression.